Sometimes it can be very difficult to decide on the perfect college graduation gifts. Why Are College Graduation Gifts So Hard? According to a 2008 survey published by the National Retail Federation, a shocking 89 percent of people faced with giving college graduation gifts resort to either cash or a gift card. Why is the graduation gift so difficult? The answer to that question lies in the symbolic nature of the event. College graduation is a moment when the security of the past childhood is finally stripped away once and for all. While at college, students would at least leave the dorm and come back home for the holidays. Summertime was a temporary return to their childhood. Then graduation comes, and the graduate is faced with the cold reality of a lifetime of daily work obligations and the responsibility of self-survival. 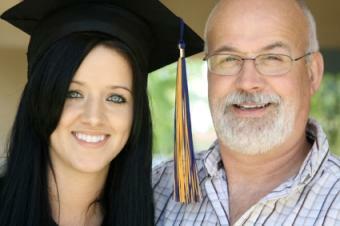 To the parent, or older family members, graduation is the realization that their "child" has completely grown up. The child is a child no more. What sort of gift could possibly represent the gravity and importance of that kind of life transition? The answer is simple. A nonconventional, unique and meaningful gift is one that the college graduate can turn to during one of those lonely nights alone in their first apartment, and be reminded of the undying, unconditional love of family. Yes, college graduates will likely need a financial jump-start as they graduate and begin their new life. And, many parents are so used to helping their kids buy school supplies by sending money that it seems like the easiest thing to do. But that doesn't mean you should write them a check and call it good. A graduation is a perfect time to let this former child understand how much of a joy, and an honor, it was to experience that childhood along with them. It's an opportunity to really show them how much you care about them, and how much they'll be missed. When most people think of a gift basket, they think of those typical prepackaged bath soap and shampoo filled baskets that are so prevalent during Christmastime. This gift basket is nothing of the sort. In fact, it doesn't even have to be a basket. It could consist of a medium sized box, completely filled with as many items as you can think of that would make the college graduate's new life in their first apartment much easier. If you do use a gift basket, make it one that is large enough to hold a good number of items.These items can be "comfort food" that you know they love. It could be their favorite scent, such as a perfume or body wash they've always loved. Add a books from their favorite author, and then toss in the movie version of one of those books. Include a small kitchen appliance, such as a nice coffee maker, so that they won't need to purchase one on their own. This is also where you can give gift cards, but make them for things like movie rentals or a local take-out restaurant. Every item should reflect something about them that you know and love. Let them know what you believe they are capable of by showing them what the magazine covers of the future are going to look like, with their photo on it! A great example of this is FakeAZine, a free service that lets you choose from an existing list of popular magazine covers, and then insert a photo of your choice onto the cover. Use this service to make them a gift that will remind them often how much you care for them. First, create a scrapbook that includes pictures and journaling about their life, their childhood, and the memories that will remain with you forever. The scrapbook will take some time and effort, but that's what makes it so special. Finally, to top it off in style, print a full-color magazine cover using Mag My Pics, and past that to the top of the scrapbook. A gift like this will be one that the student will look through for many years to come. If you have a computer and a digital camera, you have the ability to create a powerful and emotional movie for your college graduate. Making a movie doesn't require huge resources and expert technological skill. All it requires is a little time and a lot of creativity.The only thing that you'll need to invest in is video editing software and an analog-to-digital converter to load old VHS video of their childhood onto your computer. The next step is to put all of the following video elements together into one video stream, with music in the background. If you don't feel that you have the expertise to do this kind of project on your own, consider hiring a video editing expert to help you. Once you're done, this will be one of the most meaningful and deeply thoughtful gifts you'll ever give.